I don't know how many of you out there have kids, but this one was a lesson well learned! I cook and bake all the time. It is a rare occasion for the kids to have to ask for anything to be baked around here. I always get excited when someone actually asks for something different because I always shy away from stepping outside of the box. Normally when I do that, I either have to eat the whole thing by myself or throw it out if it has dairy in it. Well, a few months ago, Max (my youngest) came home from school and asked if I ever made blueberry muffins before. He had one at school (it was breakfast for lunch day) and he like it. I was super excited because the illustrator is not a huge fan of blueberry muffins and I thought I was going to have a partner to eat them with! No such luck! After working on this recipe for something I thought would be good and would hit the spot...I was the only one to eat them. Then I started thinking...hello, it was the cafeteria. It was most likely at box recipe and I bet the blueberries were dehydrated. So, after eating them all by myself...I am going to try a different route. I am not above boxed baked goods, I just have this thing about wanting to be able to make things from scratch. I still have not perfected the brownies (the illustrator says that the boxed ones are the best), but I will defeat the blueberry muffin! I will let you know when I get it where I want it! I would DEFINITELY pick your blueberry muffins over packaged ones!! they look amazing!! I so hear you. 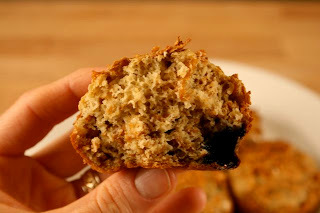 I still remember the jumbo blueberry muffins they made at my high school (and it has been...ahem...just a few years). They were pure heaven. Yet the very idea of trying to imitate those pillowy indulgences using real "from scratch" ingredients, seems like merely a fantasy! Veggiegirl, they really were good! Max would not even try them because they did not look like the ones at school...his loss! Alisa, I am going to take that challenge! You will have a recipe soon! Your blueberry muffins look yum and the presents from the last post look so beautiful..
BTW, I think the word refrigerated (on the bottom of your graphic) doesn't have a d...but not sure? They look great to me. All taste is acquired--except for our love of sugar, which is innate. 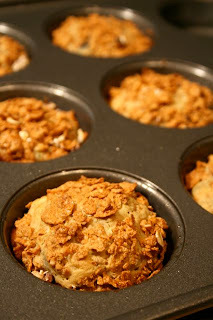 ADjusting to different things--especially healthy muffins--can take time. Those look so much better than packaged muffins. I would've helped you eat them hehe. Miniplum - Thank you for the comments! I will let the illustrator know about the spelling! Urban Vegan - You are completely right. I do sneak things in from time to time. A little bit ges a long way and for goodness sake, don't make it look healthy! ChocolateCoveredVegan - I could have used your help!